(Baltimore, Md., July 14, 2018) - The Orioles haven't been able to generate much good news this season, but they delivered some Saturday that should warm the hearts of their fans everywhere. 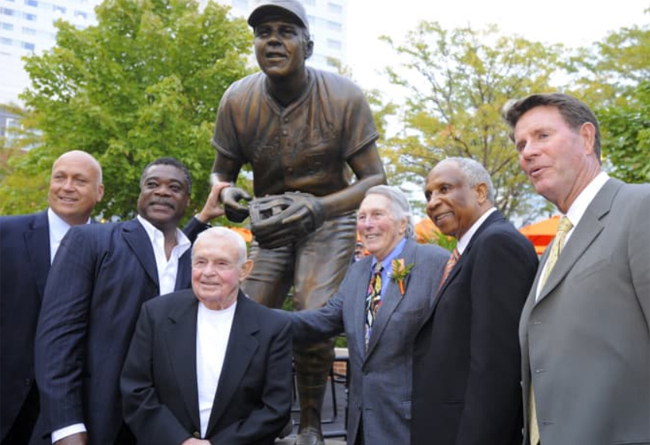 Hall of Famer Brooks Robinson, who joined the young Orioles organization way back in 1955 and became one of the most beloved players in the history of Major League Baseball, has rejoined the team in an advisory position. If you don't think that's a big deal, you didn't see the lengthy standing ovation he received when he appeared on the video board in the sixth inning. Robinson said he was contacted by Orioles executive vice president John Angelos in June. "I talked to John Angelos about three weeks ago. ... We had lunch," Robinson said. "I said I'll do anything, but I don't want to make any decisions about baseball. That has passed me by, to tell the truth." It has been a long time coming. Robinson, 81, played 23 major-league seasons, all with the Orioles, and was one of the cornerstones of one of the winningest teams of the 1960s and 1970s. He finished his career with 2,848 hits and is widely considered the best defensive third baseman ever. He remained with the team after his playing career and was a popular member of the Orioles local television broadcast crew throughout the 1980s and early 1990s. Though there was a period of estrangement after the team and Robinson could not agree on a way for him to have a continuing role with the club, he has been seen at Camden Yards more frequently in recent years. Robinson said he had plenty to do as part owner of the York Revolution, a member of the independent Atlantic League, and president of the Major League Baseball Players Alumni Association. His new role has not been clearly defined, but he said he expects to be much more visible in the community. "I'll be trying to get out in the community and do some things to try and promote this club and get people to the stadium," he said. "I mean it's a beautiful ballpark and the Orioles have always been trying to get people in and get involved in the community doing some things." Of course, somebody had to ask about Manny Machado. His theatrical plays at third base always drew comparisons with Robinson, who clearly won't be happy to see Machado traded away. "That's a little tough, but that's the name of the game," Robinson said. "I was tied to this team forever unless they traded me or said, 'You can go.' I'm happy to see guys get the chance to play somewhere else if they're not wanted in a certain city. "Manny, I think he's done a terrific job with the circumstances like they are, knowing he's probably going to be going. We'll see what happens." The struggles of this year's Orioles team also have been hard for "Mr. Oriole" to watch. "It's been pretty difficult," he said. "I always think back to the year we lost 21 in a row. I was doing television back then. I was part of that 21 in a row. It was pretty strange. ... I can't figure this out. I guess the big thing is, in this ballpark, you've got to score runs and we just can't hit, especially with men on base. "It looks like we're just going to have a rebuild, and looking at a couple of teams that did that over the last couple of years, they got better." Robinson suffered a series of health problems starting with a battle with prostate cancer in 2009, but credits that diagnosis with saving his life on two fronts. "I had prostate cancer and went through eight weeks of radiation," he said. "This goes back eight or nine years. Thank God I had it, because they discovered a tumor on my pancreas. I had something called a Whipple operation. That just knocks the heck out of you. I'm doing fine now."